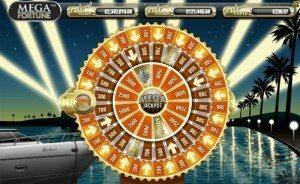 Mega Fortune is a progressive jackpot slot machine that features 5 reels and a chance to play up to 25 pay-lines at once! It’s made by Net Entertainment and is responsible for the largest Slot Progressive Jackpot ever – 11.7 Million Euros. Slot Machine is packed with features, animations and exceptional graphics. If you spin 3 Bonus symbols on an active pay-line, you’ll be entered into a Bonus Game where each of the three jackpots can be won! These are Rapid, Major and Mega with the last one exceeding 7 figures almost always. It has also exceeded $10 Million few times and is considered to be the most popular Jackpot Slot Machine in the world! Once you get those 3 Bonus symbols, a bonus game will open. You’ll see a large bonus wheel, which will consist of 3 wheels in total. First wheel will offer a chance to win credits and an entrance for spinning the 2nd wheel. Second wheel will already offer a chance to win either Rapid or Major Jackpot and of course, an entrance into the final round. Last wheel will give a shot at becoming a multi-millionaire by hitting the Mega Fortune MEGA Jackpot or consolation prize of few thousand credits! There’s also Free Spins feature offered, which is activated by spinning at least 3 Scatter symbols anywhere on the reel. Bottles of champagne are the Scatters. Once spun, you’ll be offered with a choice to choose one of them. Each will hold a different amount of spins with a certain multiplier for all winnings – up to 3x! You can also get additional spins or extra multiplier if at least 2 Scatters appear anywhere on the reel during Free Spins mode! Play Mega Fortune at Unibet Casino!